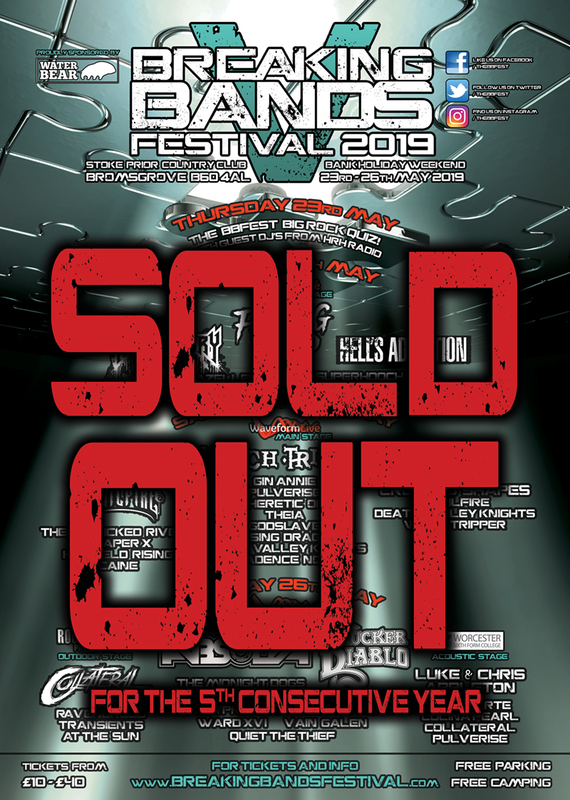 The Breaking Bands Festival Directors are proud to announce a 5th consecutive sold out festival as tickets sore with the extended capacity license. Originally sold out in the back end of 2018, the festival organisers had a backup plan up their sleeve. Something planned for 2020 but due to the support from music fans buying tickets so early, they had to implement operation bigger festival sooner! First 4 years sold out within a month or so of the event so to be sold out with 7 months to spare it made sense to increase the capacity and after a chat with the venue and an application to the council, this happened without incident. With this years festival just under 7 weeks away and the festival now sold out, the organisers are pushing their plans for 2020 and the 6th year of the event. If you missed out on tickets, either day or weekend then do not fear. A few tickets are held back for press, guests and bands families but not all get claimed so there is a waiting list. Just go to www.breakingbandsfestival.com/tickets and register your email ‘just in case’ a few tickets become available.